1-year subscription to Construction Claims Advisor (a $329 value)! -- includes 50+ FREE construction webinar downloads (Extended to April 30). 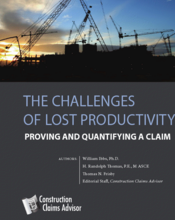 All series purchases will receive a free copy of The Challenges of Lost Productivity: Proving and Quantifying a Claim. Very well organized and to the point. Great examples were included. I liked the overview with reference to the detailed charts. Webinar was excellent. Informative, useful information, and great presentation as to the strengths of each method of claim. A very practical approach to understanding loss of productivity concepts for Contractors and Subcontractors. More and more construction claims are including a loss-of-productivity component these days. But too often the claimed amount is not properly substantiated or presented. This webinar series will help you understand what makes for a good lost productivity claim, its strengths and weaknesses, and pricing considerations. Owners will gain more insight into lost productivity issues to better assess the validity of the various cost elements. To help you identify, quantify, document, measure and price a lost productivity claim, we have assembled three on-demand webinars from recognized experts, including construction productivity professor William Ibbs, pricing experts from Sage Consulting, and construction claims expert Paul Stynchcomb. Listen in on Dr. Ibbs and Paul Synchcomb as they dive into lost productivity claims identification and measurement. Learn different ways to measure productivity, how to use performance ratios, trending and forecasting. Loss of productivity is often the reason for other claim elements, such as delay, disruption, acceleration and extended overhead. Understanding the loss-of-productivity claim's strengths and weaknesses will help you evaluate other types of claims as well. Click here to learn more about Dr. William Ibbs & Paul Stynchcomb. This information-packed program will help you learn the definition of cumulative impact, how to identify its presence on a project and how to quantify cumulative impact's effects on labor productivity. Included in this presentation is a discussion of case law on the subject of cumulative impact, examples of how to utilize the Ibbs Study, as published in the Mechanical Contractors Association of America, Inc.'s management manual, how to quantify the effects of cumulative impact on a construction project and a general discussion of construction labor loss of productivity. Learn best practices for preparation, support and pricing of any given claim or change order. In any change order or claim, there are numerous elements of direct costs of doing the extra work, the indirect and overhead costs of the work, and possibly delay and impact costs related to the changes or delays that were incurred. This impressive panel of experienced professionals presents time-tested tips on pricing, presenting, and defending against claims for loss of productivity. PDUs/PDHs Education Credits. Certificates of completion available upon request to obtain education credits.